Inspired by Charlotte, I'm wrapping up some of our christmas picture books this year: One for each day of Advent and Christmas! I've had the paper since last year (being full term with Rose I just didn't have the energy to use it) and am so glad I finally have a chance to try out this idea with our children this year! These are wrapped in purple paper with pink dots. These are wrapped in gold paper and will be placed in the empty basket on Christmas morning! Wishing you all a very Blessed Advent! I just LOVE Christmas Mosaic. I wonder how long it took for Ms. Gibbons to come up with this list of books?! It blows me away everytime I look at that master book. Wow! What a great post! Thanks so much for putting this all together. I wanted to wrap the books up for Advent this year, but ran out of time. I'll be on the look-out for purple, rose (pink) and gold wrapping paper though for next year. Oh, and I too love Christmas Mosaic. Such a fantastic resource! Oh, I know! The Book Lists that Cay put together in Christmas Mosaic are just AMAZING!!! SOOOO many books to choose from!! I've loved adding our favorites to our own collection over the past couple years! Kelly ~ Charlotte told me to check Target last year and they have the purple paper all the time. They also have the purple paper with pink and white dots which works great for the third week of Advent. Ooo, so glad you got it!!! Enjoy!! Thanks for this wonderful post! What a blessing of a resource! I hope you're having a blessed advent season! 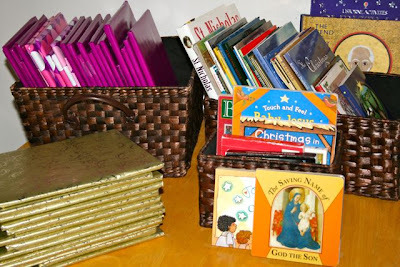 Love the book list, our Advent/Christmas books are overflowing as well!!! Our libraries are so similar I can just print your organized list for my Advent folder. I wasn't able to find purple paper this year!!! Last year Michaels had it. So I have been making purple felt "pockets" blanket-stitched with pink thread. I don't have the whole season done in one sitting like last year....but I won't have to hunt for the paper again. Have a Blessed Advent!!! Jessica, You are truly amazing! wonderful post and delightful books. i hope to one day have a home library, such as yours. it's off to the public library for us. p.s. happy to have you back. i hope your dear father-in-law is well. I am linking to this awesome list. I don't have the funds to spare on books this year, but maybe someone will get some good gift ideas. Thanks for posting this, Jessica! I just added your feed to my favorites. I really enjoy reading your posts. Have a DYNAMITE day my friend! I just added your feed to my favorites. I really enjoy reading your posts..
Hi Jessica, I saw your post with the wonderful selection of Advent books and have been working on getting them from our local library. I blogged about them today and linked back to you for the credit! Have you ever read the book Santa's Favorite Story? It's one of the ones we're picking up this year for OUR Christmas/Advent season baskets, especially since our 3.5 year old has unfortunately really picked up the whole 'Santa' thing, despite us reminding him that it's just a nice story and not the truth behind Christmas. Anyway, Santa's Favorite Story has Santa stopped in the woods by the animals who are excited to have gifts on Christmas morning, and he sits them down and tells them that HE is not the reason we have Christmas, and then proceeds to tell them the story of Christ's birth. I hope it will be a good addition to our library (and the illustrations are lovely) and I hope you'll look for it, too. Your blog is amazing and full of great help. Thanks for putting your time and talent into helping other family's live the liturgical and homeschool year. You have helped me out so much. God Bless.